Organizers have started collecting signatures for a referendum to push the city to expropriate apartments from large landlords -- companies that own more than 3,000 units like Deutsche Wohnen SE and Vonovia SE. The activists need to collect 20,000 within six months and another 170,000 by February. While pushing the state to buy apartments won’t increase supply, campaigners argue that the measure would send a signal to landlords that they need to play fair or risk losing their assets. The final straw for the activists came last year, when Deutsche Wohnen -- already one of the largest landlords in the German capital with about 112,000 properties -- agreed to buy 800 residential and commercial units on Karl Marx Allee, an imposing Stalinist boulevard in the former communist east. Residents fearing rent increases mobilized, and the city sought to block the deal in court. The property company -- one of the main winners of Berlin’s housing boom -- has rejected demands to turn over its property. Still, the chances of the referendum’s success may not be so far-fetched. The German constitution allows for expropriation in the interests of “socialization” in return for adequate compensation. 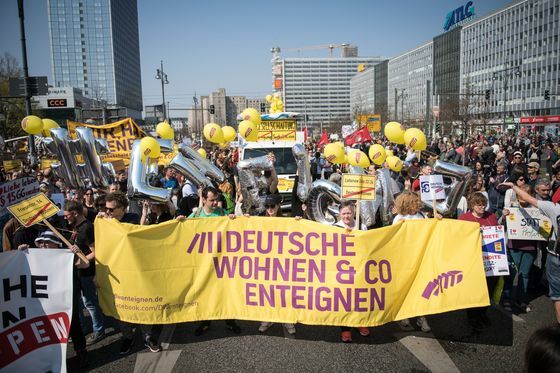 Berlin has a vibrant track record of civic activism, with a 2014 referendum successfully forcing the city to back off plans to sell parts of the former Tempelhof airfield to developers. While most mainstream politicians, including Chancellor Angela Merkel and Berlin’s mayor, are against using taxpayer money to buy apartments, there has been tentative support. Robert Habeck -- co-leader of the Greens, the second-strongest party in Germany in recent polls -- has said state housing purchases need to be considered to counter speculation. The risk is that such state intervention could scare away investors needed to bolster supply -- the only real long-term solution. The German construction industry association warned that compensation for expropriated owners could run to 36 billion euros ($41 billion), enough money to build over 220,000 rental units on government land. Germany has the lowest proportion of home owners in the European Union, and renters are by far in the majority in Berlin. That makes rental costs a political issue. Merkel’s government has taken tentative steps by passing legislation to limit rent increases and pledging to invest more than 6 billion euros in affordable housing. 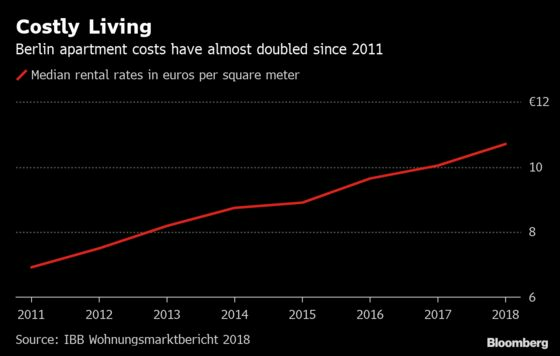 But that’s not enough for Berliners, where the growing population has pushed median rents past 10 euros a square meter -- meaning a 1,000-square-foot apartment costs more than $1,100 a month, which would still be a bargain in most other major cities. The mounting fears were evident last weekend when over 50,000 people across Germany took to the streets to protest the housing squeeze.